Does it really work or should I install a new high output water pump. The water pump might be a better idea. With a Bird, the CASCO pump looks very promising. I installed the baffel a long time ago. Seemed to help some but not totaly. When I rebuilt the engine a few years back and totaly re did the car I unstalled a 6 blade clutch fan and an electric fan in front of the radiator. Problem solved. Don't have to use the electric fan much. 55charliebird. The one inch spacer used on the 'Birds between the water pump and the timing chain cover is the root reason why the 'Birds have a cooling problem and the passenger cars usually do not. 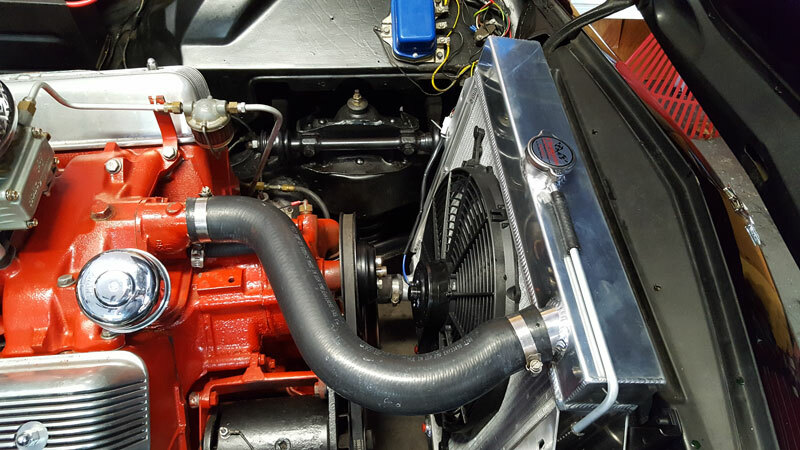 Exacerbating the 'Bird's cooling system problem is the fact that the under-hood operating temperature of a 'Bird is higher than any of the '55 - '57 Ford or Mercury passenger cars. IF you haven't already read this information submitted by Ted Eaton, I'd encourage you to do so. That said, consider reading other's input in this thread as well. Click the link below for this previous entry. If you want to fix your Thunderbird's cooling problems forever, do what I did. My '55 Bird ran hot in traffic. Here in Florida it is not uncommon to have high ninety degree days in the summer. At long lights or waiting in line to get into a cruise night parking lot, my temp gauge needle would peg and I would have to shut off the motor. I finally capitulated and installed a $200 Champion aluminum radiator. I removed the stock fan and installed an electric fan in it's place. I also installed a wide gap 170 degree thermostat. I am running a stock iron water pump. You can not make my car over heat. It sits on 170 degrees in all weather conditions. It's not concours, but it works. ...use the Casco water pump with the extra thick water pump impellor which is designed for use with the oem one inch Thunderbird spacer. What would be nice (IMO), in addition to the improved spacer, is if the CASCO WP impeller would fit an OEM pump. Best of both worlds. do I need to use the baffle with the casco HO pump? I don't think so, but I would contact CASCO and ask them. Their tech line is very good. If you are talking about the stainless steel baffle that is an aftermarket piece, that will not work with the Casco water pump. The Casco water pump impellors reach much further into the water pump cavity thus promoting additional water flow into the back of the timing cover and then into the block. As mentioned previously, those baffles do not help with the Thunderbird cooling issues and in many cases simply makes the problem worse. Leave it out and use it for wall decoration.